It reminds me to keep my tongue from wagging (mind my own business). It reminds me to be quiet. Be still & KNOW the Lord. I've read this verse so many times, that it often comes to me during times when I'm tempted to act out of character. When I'm tempted to slander. When I'm tempted to partake in the worlds view of what life should look like. 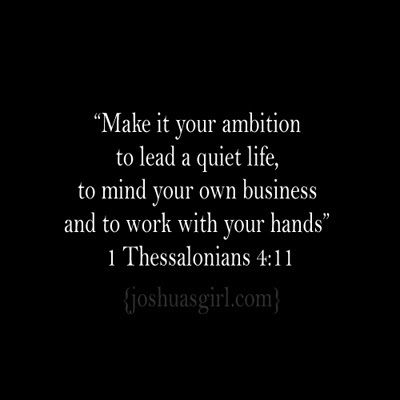 I wish I could say having this verse has changed my life, and while it may have to some degree, I still have SO much to learn. I still yearn to live that verse out in my day to day life. I desperately want to work with my hands to honour God. I desperately want to learn to mind my own business. And I desperately want to learn the art of quiet---I truly believe that is when we hear from the Lord the most. To spend more time reading God's word than focusing on the noise the world has to offer. To spend more time praying for issues that He brings to mind. To spend more time bring Him honour by working with my hands: baking bread, typing words, decorating my home, caring for my husband and children. Wow! What a wonderful verse to cling to. I need to repeat that verse over and over.